Toshiba TCx 800 has it all. Beautiful design, impressive flexibility, powerful performance, legendary reliability. The Toshiba TCx 800 POS terminal is the latest addition to the Toshiba POS product line, and provides superior flexibility for demanding retail, grocery, and restaurant environments. You asked for power, and Toshiba delivered. The new Toshiba TCx 800 POS terminal is an all-in-one platform powered by the latest Intel® 7th generation processor technology so that you can run all of your latest applications and still have room to grow in the future. With three options – Intel Celeron, Intel Core i5, and an impressive Core i7 chipset available, the TCx 800 platform has the options you need for whatever application you intend to use it for, whether it’s a point-of-sale, kiosk, or self-service checkout. The TCx 800 point of sale terminal comes from Armagh with 8GB RAM and a 128 GB solid state hard drive (SSD) standard, but is expandable to a whopping 32GB of RAM and there is a 256GB SSD option, and the machine can handle up to two SSDs internally. With gigabit Ethernet network speed and three USB 3.0 ports on board, one USB-C port standard, and one Display Port standard, this terminal has all the latest technology required and packs quite a punch for a rugged retail POS platform indeed. Part of the focus of the TCx platform was to design one terminal that could be used anywhere in any grocery, retail or restaurant environment. In addition to three processor options, the Toshiba TCx 800 point of sale terminal has three anti-glare monitor options as well – a traditional 15″ (4:3) square, and two wide-screen options, 18.5″ or 15.6″ (16:9). Merchants know it’s all about location, location, location – and POS is no different. 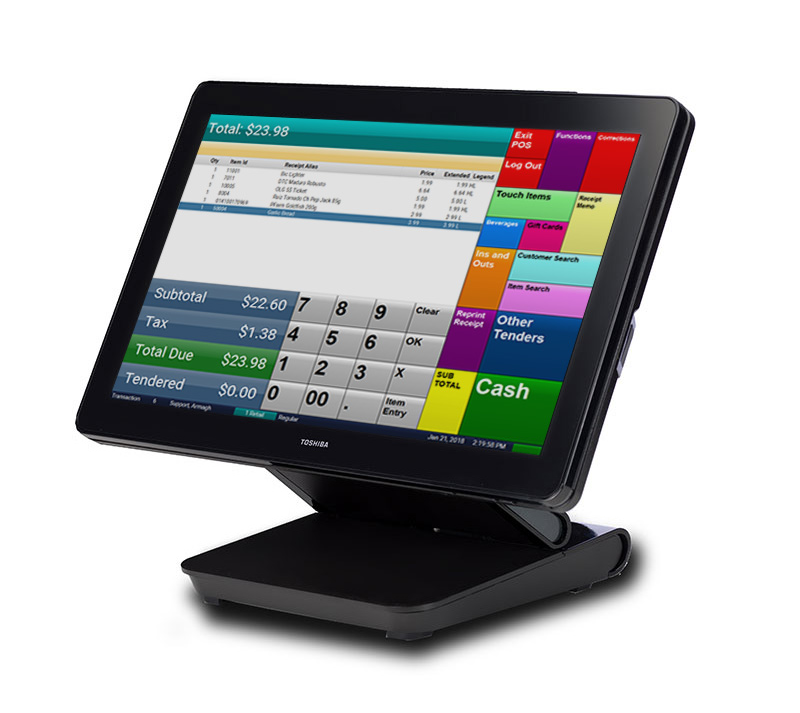 The Toshiba TCx all-in-one POS terminal can be installed with a standard monitor stand, VESA mounted on a pole or monitor bracket, or even wall mounted using a VESA wall mount bracket. Have a unique counter or kiosk installation application? No problem. 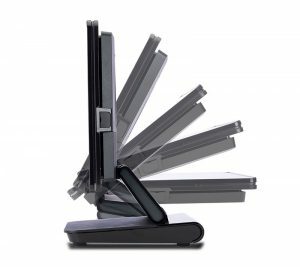 The Toshiba TCx 800 can lay flat using it’s own standard stand. Now that’s flexible! In addition to the standard port options, the TCx 800 point of sale terminal has 4 add-on port configuration options enabling compatibility with every peripheral required. Built in speakers allow users to hear when errors are made at the check out without having to look at the screen. Looking for something that fits your taste as well as your application? The Toshiba TCx 800 POS terminal also has customizable colour accents to coordinate with your décor. Now that’s customizable! The Toshiba TCx 800 open architecture platform was designed for compatibility with Windows 10 IoT (CBB & Enterprise), TCx Sky (V 1.1.01), and Linux (Kernel 4.4). The Toshiba POS brand is the #1 global leader for POS terminals for a reason – legendary reliability. Information technology managers know that they cannot sustainably run an IT department while constantly running from POS emergency to POS emergency across their retail enterprise. They understand that no brand of point of sale hardware is more thoughtfully designed and engineered for retail and restaurant use than Toshiba. Toshiba understands that these platforms will be used as cash registers – and require enough on-board bandwidth to manage all of your point of sale devices – such as cash drawers, receipt printers, scanners, fingerprint readers, MSR card readers, cash drawers, pole displays, payment devices and pinpads, RF ID, touch screens, scales, and any other devices that require an I/O resource – and they all have to work simultaneously without jeopardizing the point of sale software environment.